Murt the Flirt (g. by Murtajill). 4 wins to 1400m, A$379,400, to 2016-17, Ballarat TC Magic Millions 3YO Classic, Magic Millions 3 & 4YO Classic, MRC Movenpick Ice Cream H., 2d Ipswich TC GA $10 TIX H., 3d MRC Sir John Monash S., Gr.3, Wyong Magic Millions S., BRC PMP Limited BRC P., GCTC Magic Millions Sprint, 4th GCTC Magic Millions Cup, RL. Divine Dice (g. by Casino Prince). 6 wins. See below. Drover's Yarn (g. by Real Saga). Placed at 2 & 3 to 2017-18 in Aust. WRITTEN TYCOON (Iglesia). 2 wins at 2, A$289,325, STC Todman Slipper Trial S., Gr.2, AJC Seppelt Wines 2YO H., 2d AJC San Domenico S., Gr.3, STC Satellite S., L, AJC Meriton Serviced Apartments 2YO H. Sire. Strumming. 8 wins-1 at 2-to 1550m, A$174,410, MVRC Arrow Training Services 2YO H., ATC Hyland Race Colours H., BRC Bank of Queensland New Farm H., 2d MRC Over H., 3d BRC One Toyota H., MVRC Renown Silverware H.
My Delight. Winner at 1200m, HKJC Ma on Shan H.
ANTHEMS (Palace Music). Second top colt on the 1995-96 Australasian 2YO Classification. 10 wins-6 at 2-from 1200m to 1600m, A$860,368, QTC Queensland Classic, Gr.1, Sires' Produce S., Gr.1, NSW Tatt's RC Roman Consul S., Gr.3, AJC Fernhill H., L, Newcastle JC Cameron H., L, QTC Brisbane H., L, AJC Gold Rod 2YO H., Herbert Jones 2YO H., STC 13 Find H., 2d AJC Champagne S., Gr.1, STC Phar Lap S., Gr.2, 3d AJC Challenge S., Gr.2, Hobartville S., Gr.2, BTC Courier-Mail Classic S., L, 4th STC George Ryder S., Gr.1. YELL (Anabaa). Champion Sprinter in Australia in 2002-03. 9 wins-2 at 2-to 1400m, A$1,566,450, MRC Futurity S., Gr.1, CF Orr S., Gr.1, MVRC Australia S., Gr.1, Norman Carlyon S., Gr.2, STC Canterbury S., Gr.2, MVRC CS Hayes S., Gr.3, 2d MVRC Manikato S., Gr.1, AJC TJ Smith S., Gr.2, SAJC Breeders' S., Gr.2, STC Todman Slipper Trial S., Gr.2, BTC Champagne Classic, Gr.3, MRC HDF McNeil S., Gr.3, Moonga S., Gr.3, 3d MRC Futurity S., Gr.1. SUNG (Anabaa). 3 wins to 1400m, A$176,950, Scone RC Dark Jewel Classic, L, Hawkesbury RC Woodlands Crown H., STC Canterbury Park Events Centre P., 2d AJC PJ Bell H., L. Producer. HOLLER (Commands). 4 wins-1 at 2-to 1300m, A$748,625, ATC Canterbury S., Gr.1, MVRC Australia S., Gr.2, Red Anchor S., Gr.3, ATC Hyland Race Colours 2YO P., 2d MVRC William Reid S., Gr.1, MRC Gothic S., L, ATC More Than Ready at Vinery H., 3d ATC Run to the Rose H., Gr.2, Australian Jewellery Liquidators 2YO P.
Patriotism (Commands). 2 wins at 1500m, 1600m, A$126,200, STC Franklins No Frills H., 2d VRC Carbine Club S., Gr.3, AJC Metcash H.
Hit (Night Shift). 2 wins at 2, VATC Acorn 2YO H., 3d VRC Gibson Carmichael S., L, 4th VATC Vain S., L.
TIGER QUEST (Where's That Tiger). 6 wins-2 at 2-to 1200m, R598,950, Turffontein Gardenia H., L, 2d South African Fillies Nursery, Gr.2, Turffontein Camellia S., Gr.2, Vaal Banyana H., L.
LAMASERY (Commands). 11 wins from 1400m to 2400m, A$630,450, ATC Hill S., Gr.2, Kingston Town S., Gr.3, Colin Stephen H., Gr.3, VRC Johnnie Walker S., L, AJC Dover Heights H., Australia Day at Warwick Farm H., ATC Mad Mex Fresh Mexican Grill H., Tony & Manera Lahood H., 3d ATC Metropolitan H., Gr.1, NSW Tatt's RC Chelmsford S., Gr.2. Race Record: 22 Starts 6-2-2 A$107,000. 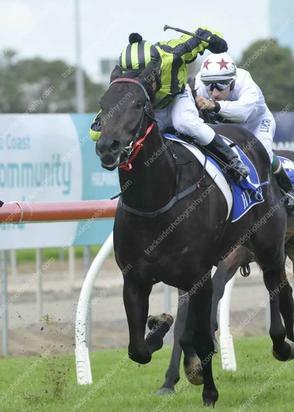 6 wins-1 at 2-at 900m, 1200m, A$107,000, to 2018-19, SCTC South East Civil H., 3d BRC Moet & Chandon Chairmans Club 2YO H., MVRC Ranvet Summer Sprint H.